Perhaps the apt comparison to make is not to Fellini’s 8 1/2, as a few have been in a mad dash to do. It’s actually only necessary to turn the clock back a couple of years in order to find an appropriate bedfellow for superstar screenwriter Charlie Kaufman’s debut film as a director; it’s Darren Aronofsky’s The Fountain. In both cases, a much-lauded and fairly young talent received more or less free reign to explore an original concept and run wild with every last impulse – in the case of The Fountain, the results were divisive at best, and disastrous in many circles. 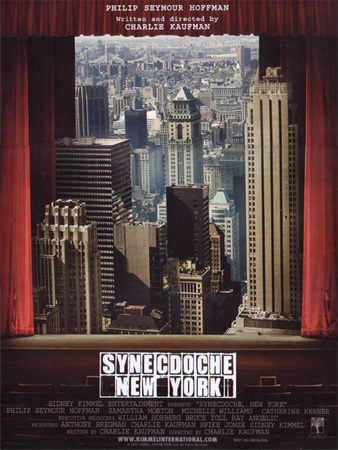 You can expect a similarly mixed reception for Synecdoche, New York, a film so incredibly overstuffed with ideas and allusions that many will be tempted to give up on it before the last reel. Before they do, however, they’ll have ushered in one of the most audacious sights and concepts to appear in an American film in some time. At their center is Philip Seymour Hoffman’s Caden Cotard, a successful playwright who’s received a “Genius Grant” in order to fund a project of his choosing. He decides to mount a massive-scale production that will incorporate all of the players in his life – all of whom happen to be women. (Hence the 8 1/2 fixation.) These women, and their theatrical representations, are tackled by one of the most prestigious female casts in recent memory: Catherine Keener, Jennifer Jason Leigh, Michelle Williams, Samantha Morton, Hope Davis and Emily Watson. They work to embody Cotard’s muse in its many forms, and as such their roles aren’t always particularly plum (particularly for Williams, whose actress character is particularly petulant), but as an ensemble foil to Hoffman’s often (deliberately) insufferable Cotard, they do wonderful work. Synecdoche is predominantly concerned with suffering and death, and as such will leave many audiences feeling vaguely annoyed at having been subjected to such a deeply depression experience. Cotard constantly suffers from mystery ailments, and time seems to collapse in on itself, with characters (and their surrogates) dying, being married and having children in seemingly short periods of time, while Cotard’s ever-expanding production – eventually including a life-size replica of Schenectady, in which the film is set – takes decades to become realized. Similarly, Synecdoche rolls back in on itself numerous times, repeating many scenes with different performers. Hoffman is more than capable of keeping the film grounded throughout these sequences, even as the film itself seems to grow tired of its endless machinations within machinations. Ultimately, however, the clockwork has to come to an end, and when it does, audiences will either feel a sense of bemused relief, or find themselves moved. I found myself somewhere in between, but I’m nevertheless anxious to delve back into its intricately annoying and delicate ways in a few months’ time.